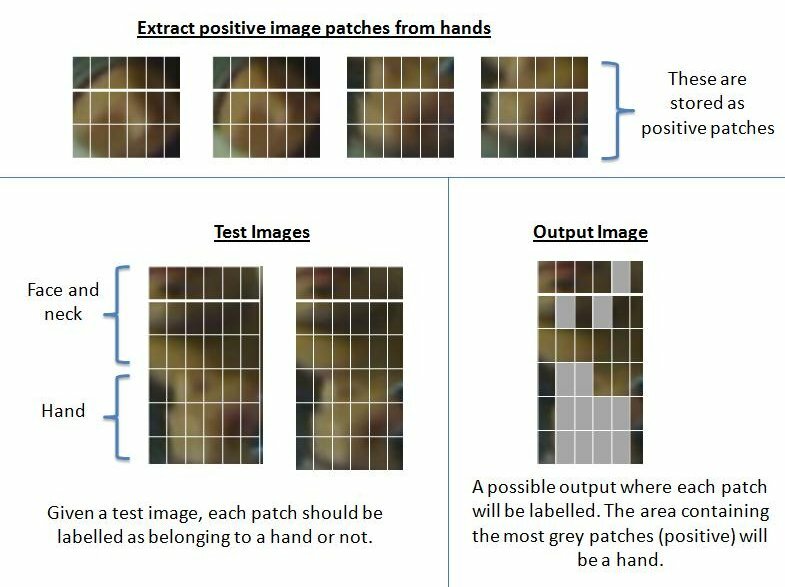 I am looking for advice on algorithms that would allow me to recognise an image patch of a hand. So given an image, I would like to extract patches that would belong to a hand (those will be positive patches). Everything else would be negative patches. My target application is to distinguish a hand (of any hand shape) from other objects without using colour, by being able to identify if a patch belongs to a hand.. The only problem with hands is that it can take any shape form. Are there any suggestions or algorithms to do the above? AFAIK hand detection is unsolved problem, especially without colour information. You're right, hand can take any form, so it is quite difficult to detect it. And I don't know about any algorithm which can provide you with good results in arbitrary conditions. What you can try to detect is hand gesture. You can analyze motion pattern and then report if some predefined gesture was detected. Check this page to see what is available on the market: http://www.eyesight-tech.com/technology/. Please note that they detect only simple gestures, and the hand occupies almost the whole frame. I don't know how exactly do they do it. May be they use the Motion History Images (MHI), Motion History Histograms or something completely different... I don't know unfortunately.